We saw that Xperia Z Ultra , Optimus G2 and Upcoming Note 3( rumoured) are already using the most powerful Snapdragon 800 chipset which is clocked to 2.2GHz and in some cases, it is also overclocked to 2.3GHz. 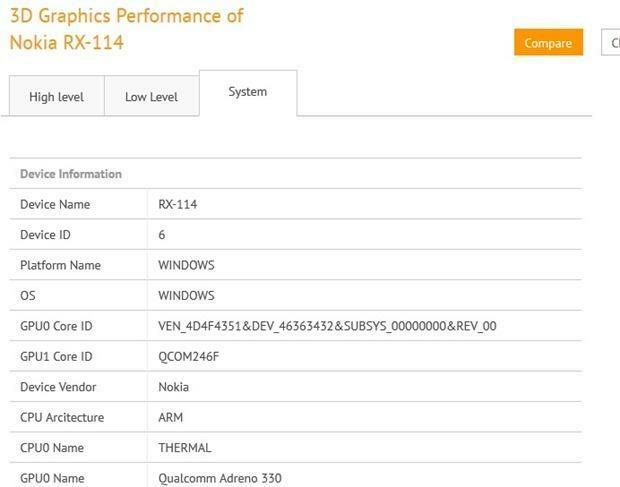 But what we saw today in the morning was some news about Nokia using the same Snapdragon 800 chipset with Adreno 330 GPU, leaked in GFXbench app, for its upcoming device which was shown as ” Nokia RX-114″. Though they is nothing mentioned about the type of this device i.e. whether it would be a 10 or 7 inches tablet or may be a new Nokia Lumia. However , if we see the screen resolution of the same device in the benchmark score i.e 1371 x 771, and comparing it with, 1366 x 768, the resolution of previous generation Surface RT , one can eventually think the device to be a new Surface RT. One more thing to be kept in mind that Nokia would go for its very own Windows 8 series rather than opting for the flop Surface RT series. Its just a leak, so we cannot confirm anything from this piece of image. May be a Lumia or a tablet or nothing but some sort of prototype used by some geeky fellow. If it by chance happens to be a tablet from Nokia side then we are sure that it won’t appear till the end of this year or may debut in 2014 ending only.